The history of mathematics is, to a considerable extent, connected with the study of solutions of the equation f(x)=a=const for functions f(x) of one real or complex variable. Therefore, it is surprising that we know very little about solutions of u(x,y)=A=const for functions of two real variables. These two solutions, called level of sets, are very important with regard to applications in physics, biology and economics as they make a map of appropriate processes described by the function u(x,y) for given parameters (x,y). This text explores a concept, Gamma-lines, which generalizes the concept of levels of sets and, at the same time, the concept of a-points. 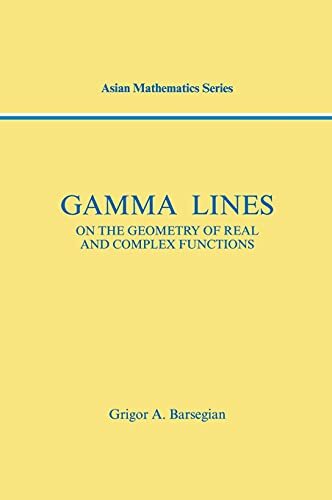 The authors provide a book on Gamma-lines for the broad specialist and show the large range of their field of applications. The general methods proposed in this volume are useful for both physicists and engineers. Grigor Barsegian is of the Institute of Mathematics, National Academy of Sciences of Armenia located in the Republic of Armenia.